Eagleview Health & Rehabilitation provides a caring, supportive environment for your loved one. We offer private and semi-private rooms for both men and women. 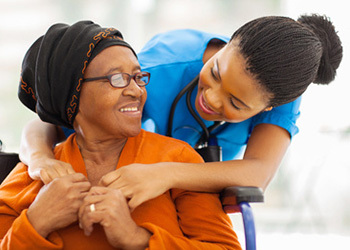 We offer 24 hours of licensed nursing care and a full staff of certified nursing aides to meet all of our resident’s needs. Our Rehabilitation Program features 3 therapy disciplines: Physical Therapy, Occupational Therapy, and Speech Language Pathologists. We use the latest technology to maximize our resident’s rehab regime. Residents can use E-Stim (electrical stimulation), Ultrasound, Diathermy, and OmniCycle, Recumbent Bike, Standing tables, parallel bars, weights and more to achieve their fullest potential. Visitors are welcome every day of the week. Come to see our residents and friendly staff in action. Schedule a tour to learn more about the unique, sophisticated healthcare environment at Eagleview Rehab. Click here to visit our website and learn more.